Lois Ann Doyle (Evans) died peacefully at home on Tuesday, March 26th, 2019 surrounded by her family. Born in Morristown to Anna and Harold Evans, she was a lifelong resident. Lois graduated from Morristown High School in 1948. She received a BS in Psychology from Beaver College, PA in 1952. She spent many years as a volunteer courier at Morristown Memorial Hospital, as well as volunteering at the Morristown Soup Kitchen. Lois was a former member of Springbrook Country Club where she enjoyed many rounds of golf as an “18-holer”. Lois spent several years at her condo on Hilton Head Island with her beloved husband, Mickey. 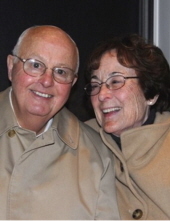 They shared a tremendous love of golf and enjoyed their time together watching tournaments. Lois was predeceased by her first husband, Thomas Francis Moore II, son Edward Joseph Moore II, and loving husband of 54 years, Michael Andrew Doyle Jr. Lois is survived by her children, Thomas Francis Moore III and wife, Patricia, of Tampa, FLA; Michael A Doyle III and wife, Sherylin, of Orlando, FLA; Marguerite LeBoeuf and husband, Brian of Basking Ridge, NJ; and Kathleen Doyle Sullivan and husband, Edward, of Morris Township, NJ. She is survived by her 11 grandchildren, Christopher, Thomas, and Michael Moore, Michael, Katie, and Tim Doyle, Michael and Emily LeBoeuf and Andrew, Maggie, Matthew Sullivan. She is also survived by her 6 great-grandchildren, Liam, Emaree, Macklin and Briggs Moore and Michael and Sofia Doyle as well as many nieces and nephews. In lieu of flowers donations maybe made in Lois's memory to Religious Teachers Filippini Missions/www.filippiniusa.org or the Rev. John Corr Family Resources C/O Sr. Marybeth Lloyd 455 Western Ave., Morristown, NJ 07960. To send flowers or a remembrance gift to the family of Lois Ann Doyle, please visit our Tribute Store. "Email Address" would like to share the life celebration of Lois Ann Doyle. Click on the "link" to go to share a favorite memory or leave a condolence message for the family.